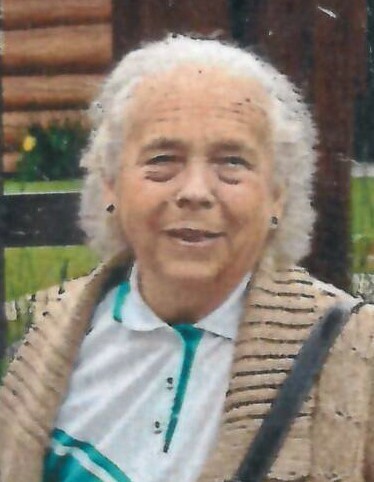 Gwen Haack, age 86 of Hoffman, MN died peacefully at Vickie and Rick’s home in Elk River, MN on December 2, 2018, of Interstitial Lung Disease (Farmer’s Lung) while being loved on by family. Gwendolyn Josephine Braun was born on October 13, 1932 in Erdahl, MN to Albert and Gladys Braun. She was baptized in Waconia, MN and confirmed in the Erdahl Lutheran Church. She went to grade school in a country school and high school in Elbow Lake where she graduated in 1950. On November 12, 1950, she was united in marriage to James Haack. They lived and farmed in the Hoffman area. She was a very hard working farm wife and single handedly milked cows for many years. When the sold the cows, she went to work at the Hoffman Care Center as a Long Term Care Nursing Assistant. One of her favorite things about working at the home was making sure the residents looked nice. She was there for 25 years and retired at age 80. When Jim got sick, she took care of him too, until his death in 1997. She loved children, and even as busy as she was, one of her greatest joys was when she had kids around. There are very few of her nieces and nephews she didn’t take care of at some point, and she honestly loved each one of them. She absolutely doted on each grandchild, great-grandchild and honorary grandchildren. She also loved her gardens, both vegetable and flower. Gwen is survived by daughter, Vickie Birdsall (Rick); daughter-in-law, Sheila Magnuson (Gary); grandchildren, Bob, Derek (Sarah), Trevor, Blake (Jenna), Crystal, Kyle, great-grandchildren Drake, Clayton, Caleb, Aubrey, Aviana, Ezekiel, Hezekiah, Trysten, Vayden, Arielle & Liberty; significant other, Sam Coleman; sister, Janet Enervold (Donald), brother, Harlan (Ella); sisters-in-law, Arlene Gulbrandson, Shirley Fiebelkorn, Sandy Backman, Carol Braun; brother-in-law, David Haack (Marily), nieces, nephews and the Coleman clan. She was preceded in death by her husband, Jim; son, Daryl; sister, Sylvia Rhode; brother, Bob Braun, and other relatives and friends. Memorial Service: 11:00 AM Monday, December 10, 2018 at Messiah Lutheran Church, Hoffman, MN with visitation one hour prior to the service.